Fundamentals, Technicals or Speculation? What do you do? Market participants operate in three ways. Let’s try and understand them. The most important word here is value and realizing stock price reflects value of an underlying business. Understanding business model, revenue streams, valuation, balance sheet, income statement and cash flow statement is necessary. Terms like P/E, P/CF, Debt-equity, P/B, discounted cash flow models etc are discussed here. The impact of various micro and macro events like earnings and interest rate fluctuations and how they are going to impact the business is important. Playing for short term or long term is a matter of choice. But you should be able to categorize a stock as cheap or expensive based on analysis and also explain how a particular event or occurrence will impact the price. The inherent risks in this approach are availability of limited and incomplete information, incorrect analysis and sentiment driven irrational market behavior. 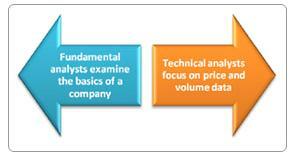 Price and volume define technicals. It’s about looking for historical patterns and charting tools to predict price movements. Moving averages, Fibonacci, supports and resistances etc are a part of this game. The basic idea is whenever a particular price or volume behavior is observed the future prices are likely to behave in a certain manner. The game becomes about probability and numbers. Defining stop losses and price targets are important in this approach. The underlying argument is market psychology and sentiments remain same and history repeats itself. The key metrics – quality of technical indicators, emotional strength and discipline to follow technical rules, and understanding that high probability does not guarantee success. This is the category where most novice traders fall into. They think they are using the above two approaches but actually are betting or speculating on the basis of their “feel” or limited set of observations. When you hear people say “my sense is” or “I feel” the stock is going to go up 10% from here without backing it up with any precise reason then he/she is a speculator. A lot of people on TV channels are market commentators and can encourage speculative behavior. You would often see them use these words. It goes without saying risk is quite high in this approach as it’s closest to gambling. Also Read Did the US default in 1971?